The Asthma and Allergy Foundation of America is a non-profit organization and we are reporting this recall to inform people with asthma who rely on this medication. If you have questions, call the GlaxoSmithKline response center, the manufacturer of Ventolin: 1-888-825-5249. Note: As of May 16, 2017, GlaxoSmithKline expanded their recall. Additional lot numbers have been added below. Patients are not being told to return the inhalers. If you have a question, call the company’s response center: 1-888-825-5249. A Class II recall is one where “use of, or exposure to, a violative product may cause temporary or medically reversible adverse health consequences or where the probability of serious adverse health consequences is remote,” according to the U.S. Food and Drug Administration. The company released a statement that said, “Though the overall benefit-risk assessment for Ventolin® HFA 200D Inhaler when used at prescribed doses remains favourable, in this situation, there is possible risk to patients of experiencing diminished bronchodilation in the setting of acute bronchospasm if reliant on a rescue inhaler that could potentially not deliver the stated number of actuations. GSK is committed to supplying high quality product and patient satisfaction, and we sincerely regret any inconvenience this recall may cause." If you need to fill a prescription for Ventolin HFA 200D, the voluntary recall should not affect pharmacy supplies. It is important to stay up-to-date on news about asthma and allergies. By joining our community and following our blog, you will be able to receive breaking news about research and treatments. Our community also provides an opportunity to connect with other patients who manage these conditions for peer support. @SuzieQue Were you able to find another brand of albuterol that works for you? @5dr80 Were you able to get everything sorted out? @kieora Were you able to get everything worked out with GlaxoSmithKline? Welcome to AAFA's asthma support community. Yes, there are other brands of albuterol. If you are interested in trying one of them, I would talk to your doctor to discuss what would be appropriate for you. Are there albuterol inhalers other than Ventolin by GlaxoSmithKline? The last 4 or 5 that I have had seemed to have been faulty. I'd like to try a different brand. @Concerned, I hear your frustration about being on a fixed income. The Asthma and Allergy Foundation of America is not associated with GlaxoSmithKline who is the manufacturer of the Ventolin inhaler. We are a non-profit organization, and we are reporting this recall to inform people with asthma who rely on this medication. Please call GlaxoSmithKline's response center at 1-888-825-5249 and speak to their representative. AAFA's blog post about What to Do If You Can't Afford Your Asthma Medicines can give you some tips on how to lower the cost of your asthma medications. @5dr80, were you able to get in touch with GSK's customer service line? I hope they were helpful! I can understand your frustration. Kieora, yay! That's terrific that everything is taken care of. I am very, very frustrated and distraught with GlaxoSmithKline right now. If this is a problem, no matter how remote or minute, shouldn't the customer be able to return the product for a new product immediately? If not, why even bring it to our attention? I have contacted my pharmacy, my husband's pharmacy, my doctor and my husband's doctor and they know very little if anything about this recall. This is not something to guess about. IT IS MY LIFE..AND OTHERS... GSK needs to do a better job...and THEY (GSK) NEED TO INFORM THE RIGHT PEOPLE BEFORE THEY INFORM THE NEWS MEDIA!!!!!!!!!!!! 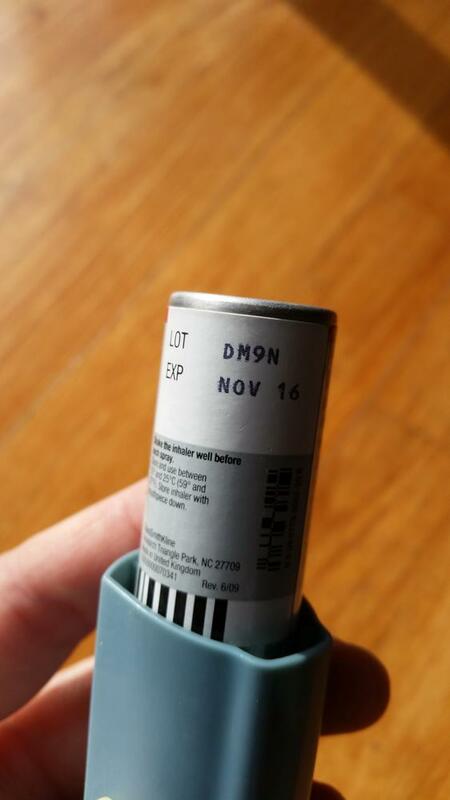 Do you have an inhaler that matches the lot numbers? If so, it is okay to continue using the inhaler, but be aware that your inhaler may have leaked and so there may not be the full number of "puffs" available. You can call the company at 1-888-825-5249 for more information. You may also want to call your doctor or insurance company about getting a new refill.